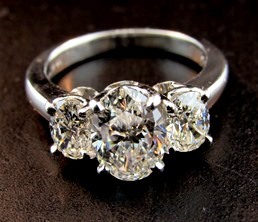 Platinum three stone oval shaped diamond ring. Center stone is 1.76ctw, two side diamonds equal 1.09ctw. G/H color, SI1 clarity. 2.85ctw. An exceptional piece that will not last long. 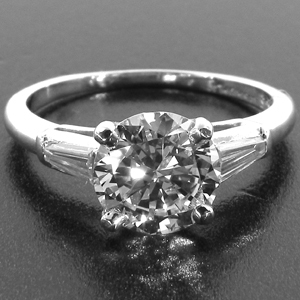 Unbelievably amazing 18k & platinum 1.79 oval shaped, internally flawless diamond ring. Center stone is GIA certified, colorless, internally flawless clarity diamond. 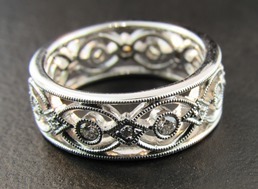 Bezel-set with filigree. Simply stunning. Platinum 1.71ctw GIA certified diamond engagement ring. 1.43ct round brilliant center diamond, VS2 clarity, .28ctw side tapered baguette diamonds. 1.71ctw. 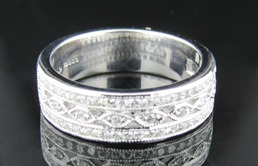 18k 1.0ctw pave diamond band. In a beautiful leafy vine design. A milgrain edge adds to the vintage feel of the band. The perfect band for nature lovers. 14k .50ctw pave diamond eternity band. 14k, .50ctw diamond eternity. Simple, elegant, with that little bit of added sparkle. Round brilliant diamonds are G color, SI clarity. Diamonds go all the away around the band. *Can be purchased in any ring size- pricing will vary. 18k Diamond Filagree Weddings band. .40ctw, 16 diamonds in total. 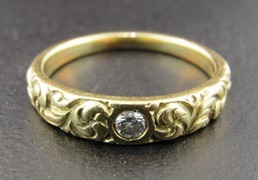 18k .68ctw diamond wide band. Beautiful sparkling diamonds and elegant mixed- shape design. SI clarity, near-colorless diamonds. 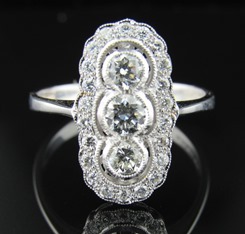 18k Triple cluster diamond ring. Three large round brilliant diamonds with milgrain edge and pave diamonds surrounding the center stone. Gorgeous antique design. A beautiful engagement or anniversary piece! 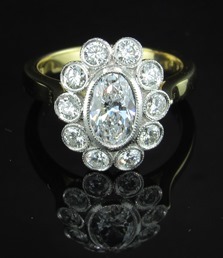 Gorgeous 14ky .28ctw diamond band. 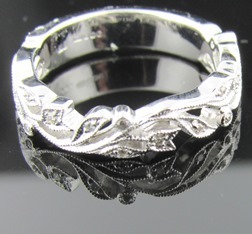 Includes 8 beautiful round diamonds on band. Brushed , matte finish. Platinum, .25ctw diamonds. 3.5mm band. 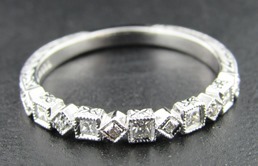 18kw mixed shape diamond band. It would pair lovely with a princess cut engagement band. Or worn stacked.